Wise Agent is a real estate customer relationship management (CRM) solution for agents and small brokerages. The platform uses landing pages to capture information from visitors who click on targeted ads, emails and sales pipelines to nurture leads through the sales process, and third-party software integration to ensure all communication is managed in one place. However, if you’re part of a growing team, check out Real Geeks. The cost is higher than Wise Agent starting at $199 per month, but offers team features like lead assignment and idle lead re-assignment. Also, check out their managed Facebook and Google Ads lead generation options on their website by clicking the button below. Wise Agent offers realtors a way to manage landing pages, lead tracking, and marketing in one place. Wise Agent is able to capture leads via custom landing page forms and automatically add them to a CRM with sales pipeline functionality. Wise Agent users then market to these leads using auto-responders and emails triggered to push leads through the sales funnel. Finally, as a way to track a lead’s journey from click to sale, users regularly review lead communication via the Wise Agent dashboard. The lead capture and communication monitoring functionalities of Wise Agent are perhaps the most valuable features for agents. To capture leads, Wise Agent lets real estate agents create templated landing pages featuring specific properties, and then create advertising for those listings on social media or Google using third-party ad integrations. Once a lead submits contact information on a landing page, Wise Agent sends an automatic message to the lead to make the initial contact. Users can then use Wise Agent marketing tools to nurture the lead through the sales cycle. The sales and transaction part of Wise Agent—known as the transaction manager—allows a realtor to create to-do checklists to make sure that tasks are completed in a timely manner. Users can create customizable checklists of things to do for each client, as well as checklist templates they intend to use for multiple clients. It’s also easy to track multiple active checklists at once on Wise Agent. 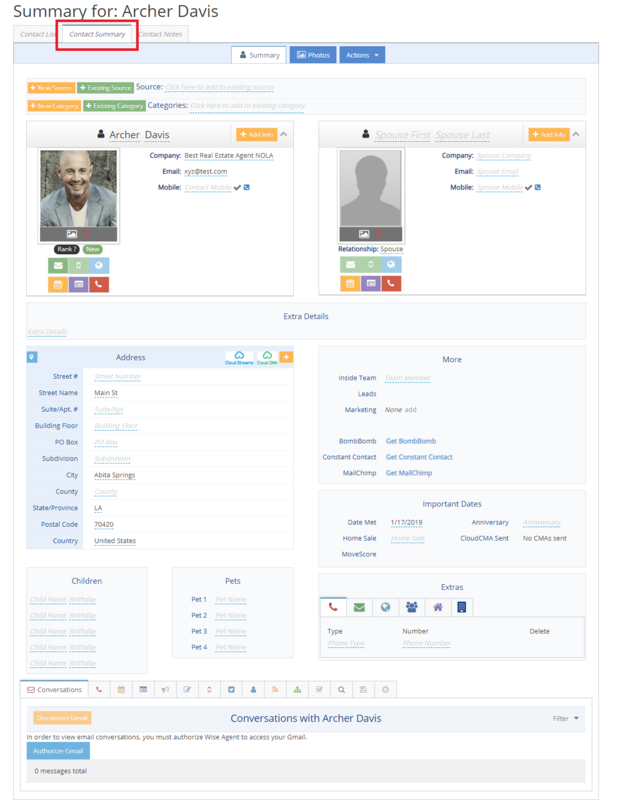 Wise Agent CRM dashboard for real estate agents. Wise Agent is priced at $29 per month. Real estate agents can save 14% by subscribing to a yearly plan, billed at $299. Each plan includes complimentary onboarding, free 24/7/365 live customer support, and access to unlimited training. With a 30-day free trial, real estate agents can try the features without risk. Closing a real estate deal with Wise Agent CRM requires the agent or broker to create an account, add their contact lists, design the landing pages for their properties, set up marketing, and integrate third-party solutions. Once Wise Agent is operational, real estate agents can use transaction checklists to monitor progress and sales reports to measure results. The first thing you should do is register for the Wise Agent 30-day free trial. The free trial allows real estate agents to test all of the features in a live dashboard with up to 50 contacts. Go to Wise Agent and click on the green 30-day free trial button to sign-up. You will get instant access to the real estate CRM. There are no credit card requirements or limits on the Wise Agent services during this time, so you will have free reign of the platform to test all of the features and gauge ease of use. If your credit card is not on file when the free trial elapses, then your account is deactivated. Transition to a paid program at any time during the free trial by adding credit card details and upgrading in the Wise Agent platform. For brokers and larger real estate agencies, one of the biggest benefits of a real estate CRM is the ability to organize internal and external team members. With four additional team member licenses in each Wise Agent account, realty offices can share a master calendar, track assigned leads, and coordinate efforts to streamline workflow. Add a team member easily by clicking on your name in the top right menu bar. Click on “Add a team member” in the menu bar and a screen will appear, allowing you to input team member information. 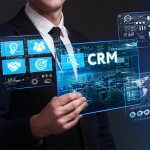 Adding contacts and leads to real estate CRM can be done three ways—by adding them manually, by importing a spreadsheet of contacts, or by syncing with third-party software. For agents who need to manually import leads into Wise Agent, click “Contacts” in the menu bar and scroll down to the “Add Contacts” option. This will prompt you to add all contact information manually. 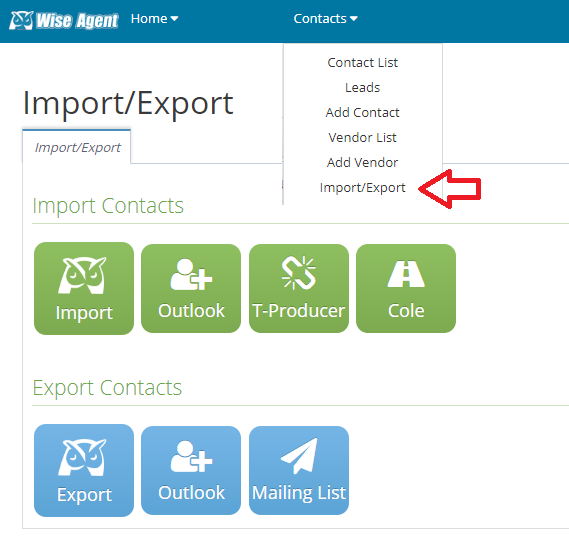 Import/Export contacts in Wise Agent CRM. To upload a spreadsheet of contacts, either click on the green “Import” button in the screen above or click on “Import/Export” from the top menu. 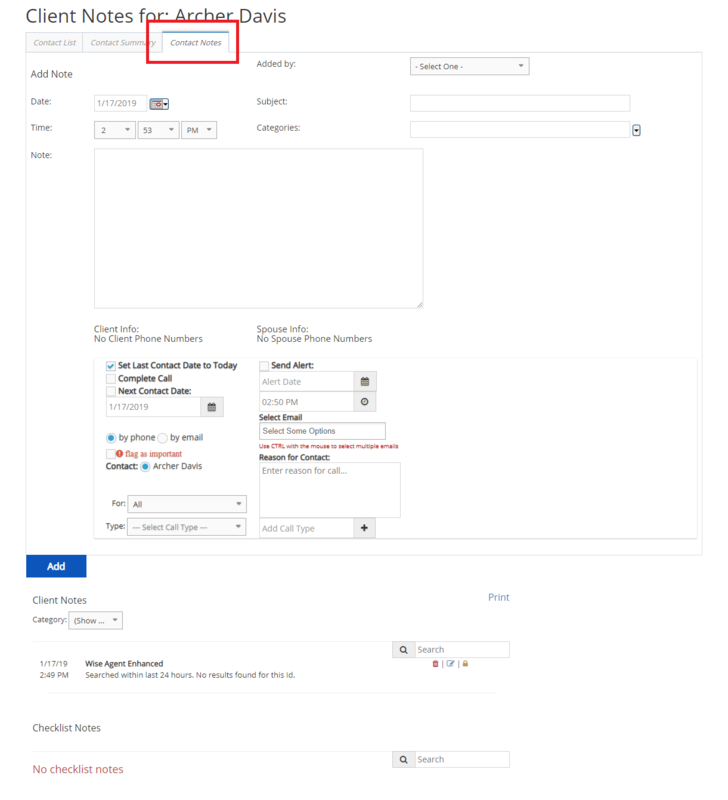 On the next screen, upload a file (.csv format is preferred) to your CRM. If you need an example spreadsheet to show the correct formatting of your spreadsheet before uploading, then click on the blue example.csv button in the upper right-hand corner. Wise Agent allows users to add extensive notes to each lead record—including address, contact information, family information, past conversation details, and more. It’s important to add this data in Wise Agent, as it helps target marketing efforts and ensures effective communication. To add this information, click on “Contact list” under the “Contacts” menu item at the top of the dashboard and add data for individual clients. In the “Contact Summary” tab, realtors can add contact details for leads, information about family members (including pets), and record important events in the sales cycle. Next, click on the “Contact Notes” tab and input notes about contact history or sales efforts. Add marketing information in these fields that will be helpful in the sale process or would be important for a report. Wise Agent categories help to group leads together for follow-up and marketing purposes. Assigning categories means moving leads into groups for easy management and mass emails. 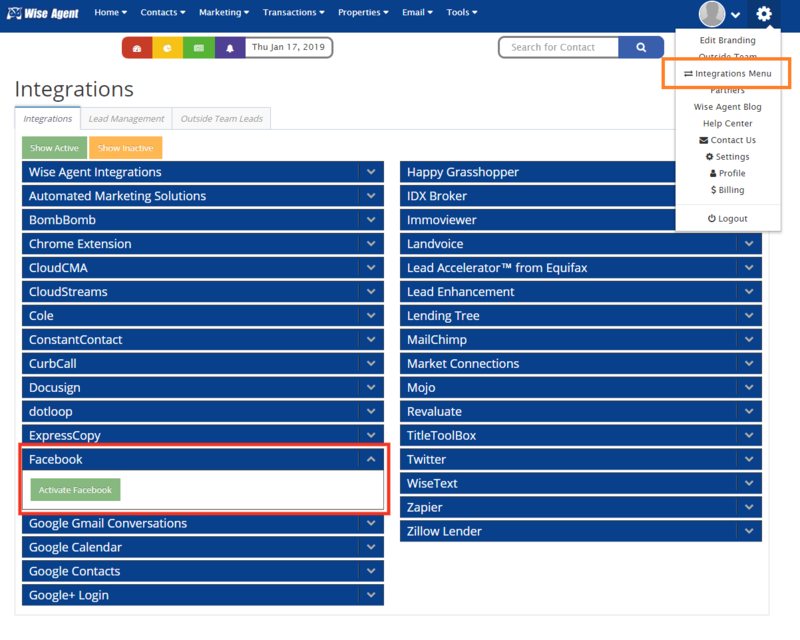 Assign categories by clicking on each contact to add data (see red square below) or setting up global categories in the “Manage Categories” tab of the contact list (see green square below). For example, you might assign the category of “New Lead” to contacts that have been in your system for fewer than 30 days. Another category might be a zip code or property type that aligns with certain newsletter campaigns you intend to create. Add marketing data, categories, and individual contacts in Wise Agent. If you are currently using software to generate or track leads, you may want to integrate it with Wise Agent. 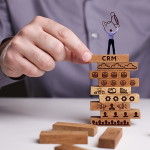 Third-party solutions are a critical part of CRM because they help real estate agents manage all of their efforts in one place—including social media management, email, scheduling, lead generation, and more. To integrate third-party solutions, click on the “Welcome” tab at the top of the dashboard in the blue bar. There will be a drop-down menu that offers you a choice called “Integrations Menu.” Click “Activate” for the third-party solution that you want to add and Wise Agent will walk you through the integration process. To ensure this process is smoother, make sure you are logged into your third-party account when you click “Activate” in Wise Agent. Wise Agent third-party integration partners (image via website). Once you have your leads and contacts synced with Wise Agent, create checklist templates to make sure no communication or lead nurturing tasks fall through the cracks. The templates can be designed for any recurring list of tasks that you need to monitor, ensuring you don’t have to recreate the checklist every time you need it. The checklists themselves are the task lists you’re actively monitoring. To set up these checklists, navigate to the top of the screen and click on “Transactions.” Then, click on “Checklist Templates” from the drop-down menu. This will gives you a two-tab screen that allows you to toggle between active Checklists and Templates. Click on the “Checklist” tab to see what checklists are currently active, or to start a new custom checklist. Click on “Templates” to create a new checklist template or select a template to start using. A landing page showcases a specific listing and encourages visitors to request more information. Before you set one up, however, you should add your property listings. Then, design your landing page using a Wise Agent template and add features like home valuation tools and loan calculators. 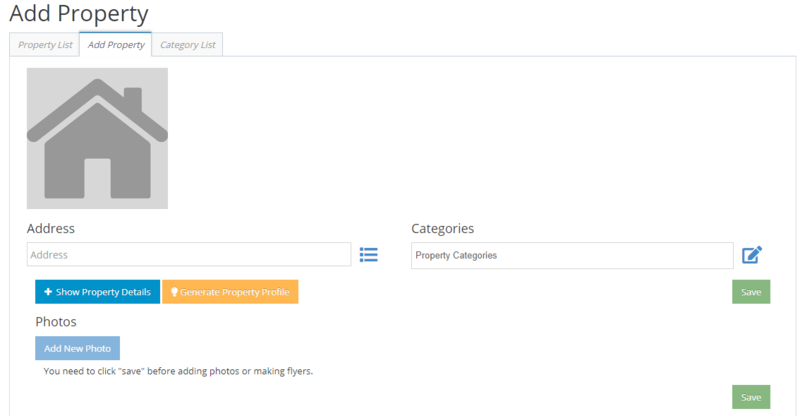 Adding a property listing through Wise Agent is easy with the form fill wizard. By clicking in a field, a real estate agent can add important home details and have the listing ready in a matter of minutes. These property listings are able to be added to the landing pages individually or as apart of the user website search. To add a listing, click on “Properties” in the blue menu at the top of the screen and select “Add property” from the drop-down menu. Input the complete address, the property category, and any available photos. Wise Agent Add Property feature. 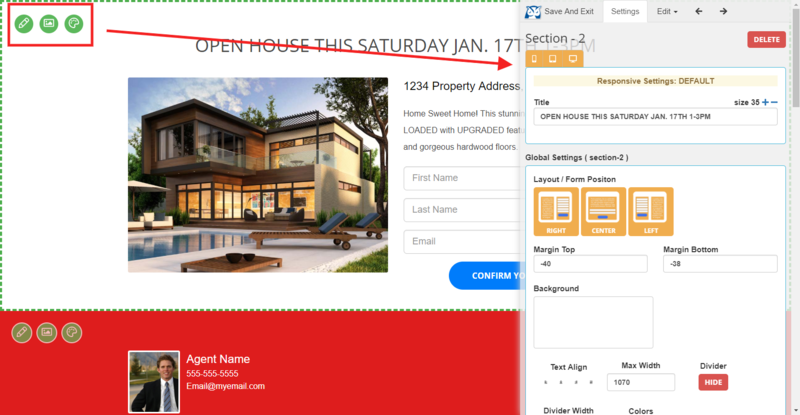 Wise Agent landing page templates are designed with these top goals of real estate agents in mind: announce an open house, capture buyer information with property data, receive seller leads through market reports, and highlight single properties. They are simple to edit by uploading photos and clicking fields to change different parts of the template. Start by picking the template that best suits your goals by clicking on the “Marketing” menu option at the top, scrolling through the types of templates available, and clicking on the one you want. Wise Agent landing page templates. Open house: This landing page is used to announce and promote an open house for a listing. Seller’s landing page: The seller’s landing page is designed to entice sellers to leave their contact information for the real estate agent. Buyer’s landing page: The buyer’s landing page is for agents who want to connect with buyers about specific properties. Home valuation: The home valuation landing page is aimed at exchanging a report on property value in exchange for seller information. Single property: This landing page is for advertising and attracting buyers for a single property listing. Once you’ve selected your template, you will see the editing screen. Click the green buttons in each section of the new template to launch an edit box. 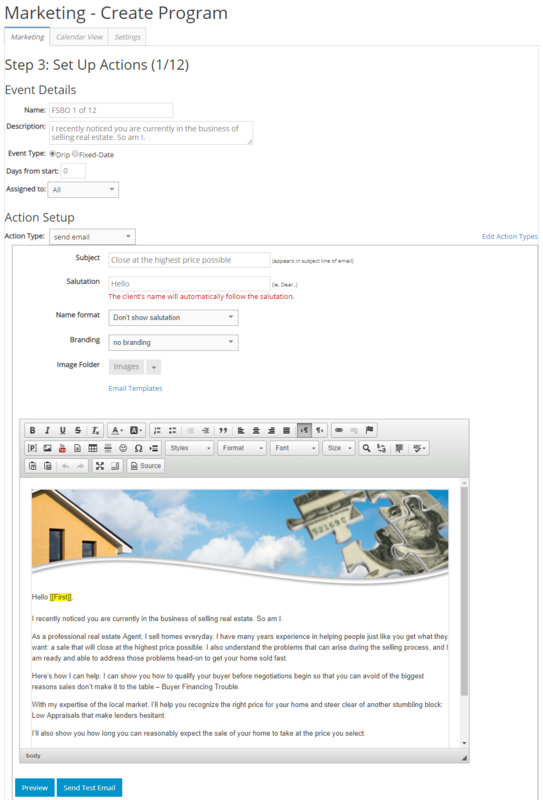 In this edit box, add images, change headers, align text, and create forms. All edits are done in the easy editor that allows you to instantly see the results. After saving the page, you will have the option to make your new landing page live so it shows up on the web. By clicking on “Tools” in the blue menu bar at the top, the calculator tab will drop down. Just pick the type of calculator you want to add and tell Wise Agent where to insert it on your landing page by walking through the pop-up steps. Wise Agent includes a loan payoff date calculator, a debt consolidation calculator, and a home affordability/mortgage rate calculator, among other options. Marketing automation is a vital part of the CRM because it allows both immediate response to contacts and the nurturing of leads throughout the sales process with templated emails. Wise Agent takes a dual approach to marketing automation by providing templates that can be customized as well as start-from-scratch email campaigns. To set up drip marketing, decide on your campaign type and customize your campaign templates with images and texts. The first step of the drip marketing campaign for Wise Agent is to decide if you want to create your campaign from scratch or use a template that can be customized later. If you decide to create your own drip marketing campaign, then Wise Agent will ask you whether you want to send emails at intervals (drip dates) or on a specific date (fixed dates). Drip dates: For real estate agents who want to send contact or follow-up messages to buyers, drip dates are the most effective. Dates can be set for every few days, weeks, or months to make sure that you stay top of mind. These types of email campaigns might be used to check in with a buyer or prompt a showing of a particular property. Fixed dates: If you want to send specific emails on certain dates, like holidays or open house days, then choose a fixed date campaign. This ensures all contacts you choose will receive your email, regardless of where they are in the buying/selling process. To get started, click “Marketing” in the top blue menu bar of Wise Agent. Click on “Drip” campaign if you want to send several emails on a set schedule. Type in the time delay in the box under the drip radio button. If you want a fixed date (for a holiday, for example), then click on the “Fixed” date radio button and select your date. If you do not want to create your emails from scratch, then Wise Agent templates are advisable. Choose “Add stock program” to use templates for a continuous release of emails to buyers and sellers. These templates are categorized according to a wide variety of goals and purposes, including marketing to for sale by owner (FSBO) listers, expired listing owners, contacts needing reports, new leads, and past clients. Pick the appropriate stock program for your email campaign by clicking the radio button next to the right type of template. Change the types of stock programs by clicking on the gray Wise Agent Stock Programs drop-down button. Clicking on a radio button next to the template and selecting “Next” will load those templates into the editor for you to customize. Wise Agent drip marketing campaign templates. Once you have decided what type of drip email campaign you want to use, Wise Agent will prompt you to edit your email series and customize fields. Add the subject line, personalized greetings, the contact list, and edit the images or text in the body of the email quickly from the template. You should always take the extra steps to preview your email and send yourself a copy using the “Send test email” button at the bottom to see how it will appear to your buyer or seller lead. Customize fields of Wise Agent drip marketing. Wise Agent includes the ability to draft flyers, newsletters, and postcards for open houses or other events. To create your own, go to the top blue bar and click on “Marketing.” In the dropdown menu, you will find options for letters, newsletters, and flyers. Pick the type of direct mail piece that you want to create and the template that best matches your goals. 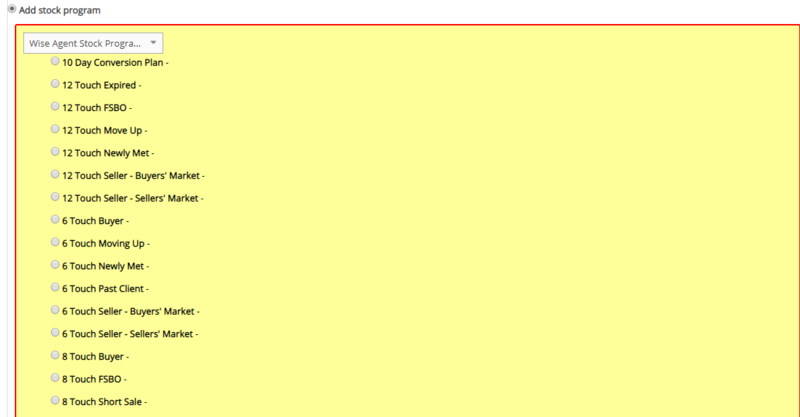 Once you have the editor open, replace template images and text with your own by clicking on the appropriate field. When you’re done, Wise Agent allows you to download the file or print the direct mail piece after completion. If you intend to mass print these flyers or direct mail pieces, then you might want to consider a service like ProspectsPLUS! Wise Agent CRM reporting is robust. It allows users to track leads across the sale funnel, monitor expenditures, and review email marketing with real-time data. Some of reporting is native to Wise Agent, while some come from third-party software. Start by running native reports, then use third-party integration functionality to access additional data. Run reports by clicking on “Reports” in the blue menu bar at the top. The screen that follows shows a list of all reports available to you. Click on the report you want to run and add a date range. Click “Get Report” to run the report. Wise Agent makes it easy for real estate agents to access information quickly about the platform’s marketing and lead tracking modules. To access detailed training videos and 24/7/365 live customer support, click on the “Support” tab on the dashboard. Wise Agent supplies a training video for practically every piece of the CRM. The videos are easy to follow with a detailed overview of how the module works and how the real estate agent can use Wise Agent to increase their sales potential. Select the self-training video you would like to view in the categories of Welcome Classes, Feature Classes, and Integration Classes. Wise Agent has teamed up with McKissock Learning, the parent company of Real Estate Express, to provide real estate agent classes and listing certification reminders. If you have to renew your license or want to get a certification, then add it to your dashboard as a reminder. 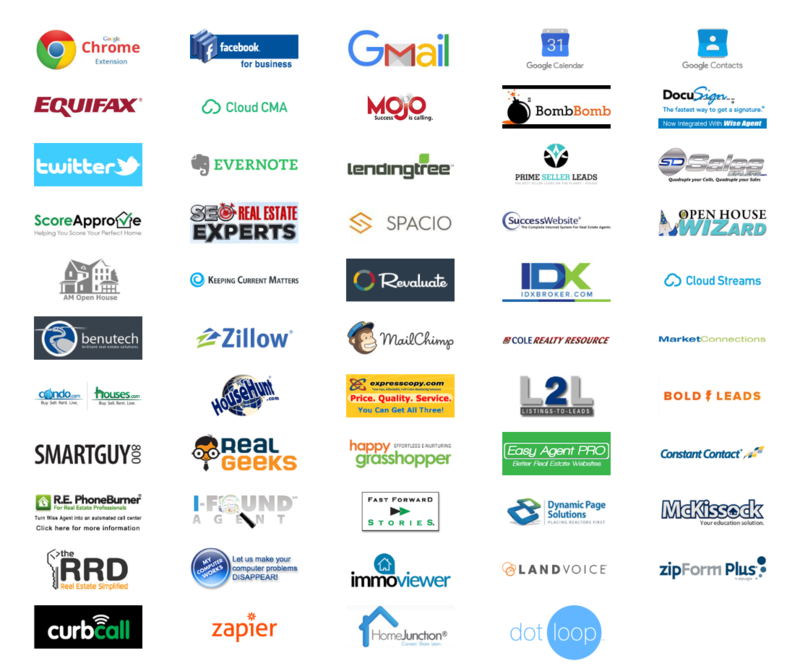 The reviewers on Capterra and G2Crowd agree that Wise Agent is one of the best real estate CRMs on the market. Most reviewers felt that the Wise Agent platform was easy-to-use with intuitive features that did not require a heavy learning curve or large price tag. One common thread among reviews was that the interface felt dated and could be improved for aesthetic reasons. Although the dated interface did not interfere with the operation or functionality, it is worth noting that Wise Agent also does not have a mobile app for on-the-go operations. Learn more about Wise Agent user reviews and pricing. Wise Agent is missing the updated, sleek format in the pipeline dashboard and marketing modules frequently seen in many other alternatives. If modern modules are important to your user experience, then you might want to examine other lead generation and tracking solutions. Real Geeks is an expensive lead generation and CRM option priced at $199 per month for one or two agents with a $500 onboarding fee. Real Geeks does have a few advantages over Wise Agent, like a Facebook advertising tool, managed Google AdWords campaigns, and short message service texting abilities that agents might find useful. Learn more about Real Geeks user reviews and pricing. BoldLeads is a lead generation company with landing pages and a CRM system to nurture contacts. The primary focus of BoldLeads is exclusivity as they only accept one real estate agent per ZIP code. With a flat fee of $299 per month, $250 onboarding fee, and a minimum $250 advertising budget with a six-month commitment, BoldLeads is right for larger agencies and brokers. Learn more about BoldLeads real estate lead generation. 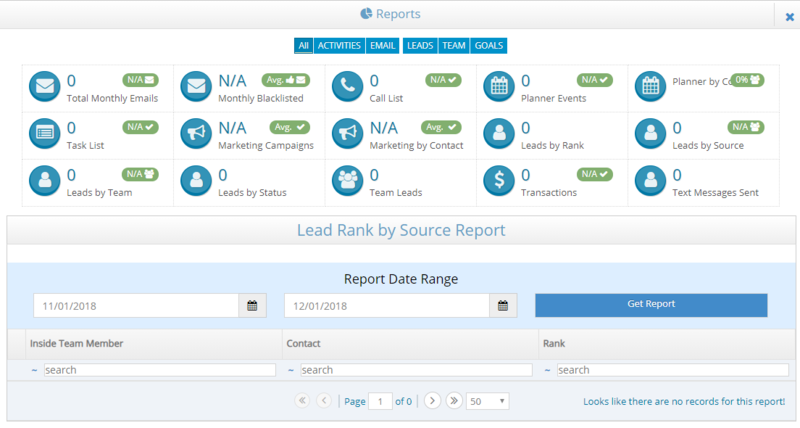 At $25 per month, LionDesk is probably the most comparable to a real estate CRM because it does not include a lead generation module or service. While realtors can integrate third-party solutions for email and lead generation, LionDesk’s standout features include Text2Sell with special tracking codes, texting abilities from the dashboard, and video emails. Find out more about LionDesk real estate CRM. Market Leader adds to the features of Wise Agent with the ability to integrate the multiple listing services (MLS) into your website, as well as integrated lead generation. 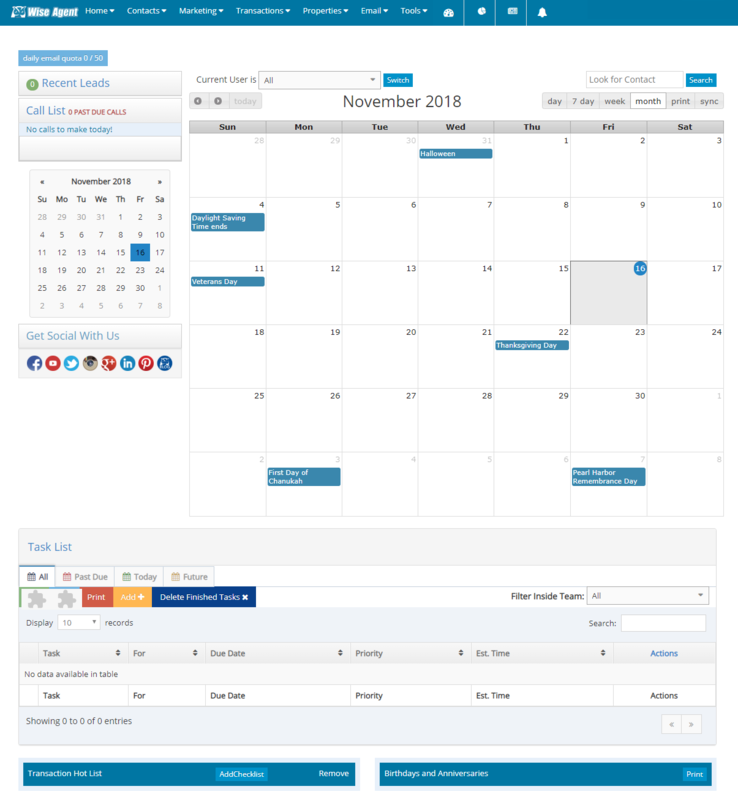 The monthly fee of $99 includes a CRM, IDX website, and mobile app. Lead generation through Market Leader costs about $30 per lead depending on your location. Market Leader advertises for clients and does not resell leads to multiple agents. Learn more about Market Leader user reviews and pricing. Top Producer starts at $40 per month with a $99 set-up fee for the same features as CRM, but there are some interesting real estate-specific upgrades like MLS integration and a mobile-friendly app. Find out more about Top Producer user reviews and pricing. Can I Use Video Email With Wise Agent? Wise Agent readily integrates with BombBomb to send stunning video emails to promote a property or introduce a buyer to an agent. BombBomb offers a free 14-day trial to examine the features and seamless integration with Wise Agent. Does Wise Agent Require a Contract? Wise Agent payment plans are set up monthly. There is no contract required. Is Wise Agent Good for Small Teams? Yes. Each Wise Agent account comes with the ability to add four inside and/or outside agents and track leads passed to others. Wise Agent CRM can help brokers and real estate agents convert leads into sales by easily engaging with buyers and sellers. By signing up for a Wise Agent account, setting up landing pages, creating your marketing, and integrating third-party solutions, agents will notice an increase in ROI and ease of workflow. Real Geeks is an alternative to Wise Agent that offers a fully editable IDX website and CRM for $199 per month, and also a Facebook Marketing Tool with optional managed advertising starting at $500 per month with a $250 budget. To find out more about Real Geeks, click the button below.